Beauty in Chelsea: Art That You Can't Live Without: Are we Really in a Financial Crisis? Art That You Can't Live Without: Are we Really in a Financial Crisis? I was having lunch at Sant Ambroeus in the West Village today, and I overheard quite an interesting conversation about art. Sitting one table away from me were two men who I soon figured out were art collectors dining with the model (and former co-host of Tim Gunn's Guide to Style) Veronica Webb. While Webb was remarking on how red the tomato sauce on her pasta was, the two men got into a friendly debate. The first one remarked, "Nowadays I only buy art that I can't live without." To which the other man scoffed, "What do you mean by that? I can live without all my art. There's no such thing as art that you can't live without." First man: "Well then you're not buying the right things. I have one work in my home by X (over-exposed contemporary artist and bonafide hipster), and I wouldn't sell it even if you offered me a million dollars, not that that's so much money, but I wouldn't sell it for any amount of money." Man two seemed skeptical, but then I had to pay the check and missed the end of the interaction. Even as an art historian, the concept of art that you can't live without sounds a tad hyperbolic to me, unless you're an artist and the work in question is your own creation. What do you think? Is collecting art a luxury, a necessity, or something in between? 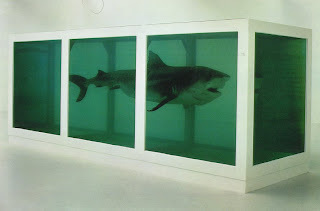 photo credit & note: Damien Hirst, The Physical Impossibility of Death in the Mind of Someone Living, 1991, tiger shark, glass, steel, formaldehyde solution, Charles Saatchi collection. Image found at http://www.artchive.com. Another Damien Hirst work recently sold for ninety five million pounds at Sotheby's in London, despite the global financial meltdown. I think of art as transforming. Art transforms space, and changes the ambiance of a room and thereby a life. A life without art is a colorless and unimaginative life. Artsmart I completely agree with your comment. Very well said.